Although just 15 years ago international investing for individuals like you and me was largely unheard of and only available to ultra-high net worth investors; we've come a long way since then! And what the average South African doesn’t realise is you can now invest in markets from London to Tokyo - and in any global stock that peaks your interest - with nothing more than a simple internet connection… All from the comfort of your own living room! Even better, our exchange control laws have been relaxed, meaning you can now take a significant amount of out of money, safety and legally out of South Africa without having to run though endless red tape. And Offshore made easy: The painless way to get your money out of South Africa and into the most profitable markets in the world, will help you do just that. In this report, you’ll discover exactly how to go about investing offshore - so that you can take advantage of the huge world of opportunities available out there today! Find out how YOU can invest in Apple, Coke, Microsoft and Google today! Today I drove to work in a German designed car listening to music on a South Korean manufactured radio sent to South Africa by a Swiss shipping company. The world's gone global - and South Africans are getting left behind! You see, the biggest and best companies - and the biggest and best profit opportunities in the world today are found outside of South Africa. But it doesn’t have to be that way anymore! The world's gone global - Don't get left behind! You see, although just 15 years ago international investing for individuals like you and me was largely unheard of and only available to ultra-high net worth investors; we've come a long way since then! And what the average South African doesn’t realise is you can now invest in markets from London to Tokyo - and in any global stock that peaks your interest - with nothing more than a simple internet connection… All from the comfort of your own living room! Even better, our exchange control laws have been relaxed, meaning you can now take a significant amount of out of money, safety and legally out of South Africa without having to run though endless red tape. And that's exactly why I've createdbrand-new report, titled Offshore made easy: The painless way to get your money out of South Africa and into the most profitable markets in the world! In this report, I explain exactly how to go about investing offshore - so that you can take advantage of the huge world of opportunities available out there today! •And the potential triple-digit profits you stand to gain! And you get all this for the special one-off price of just R249. 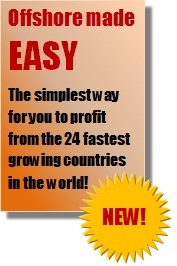 Claim your report today and start profiting from the fastest growing countries in the world! What's more, if you order today, I'll throw in a FREE special report on The simplest way for you to profit from the 24 fastest growing countries in the world! In this report I reveal the quickest, easiest way to take advantage of 24 of the fastest growing offshore opportunities on the market today - with less than R5,000! So make sure you respond today so you don't miss out on this special bonus! Here's to unearthing a world of opportunities! PS:I'm willing to give you 30 days to review Offshore made easy: The painless way to get your money out of South Africa and into the most profitable markets in the world! - Absolutely risk free. If my comprehensive, yet easy to understand report doesn't answer all your questions about getting your cash easily, quickly and painlessly out of South Africa and into a world of opportunities, I'll personally refund you every cent. You have nothing to lose -and a world of opportunities to gain - claim your copy now! "I had no idea what I was missing out on until I read this report. Thanks to Offshore Made Easy I now have the opportunity to invest in over 20 of the worlds fastest growing countries"